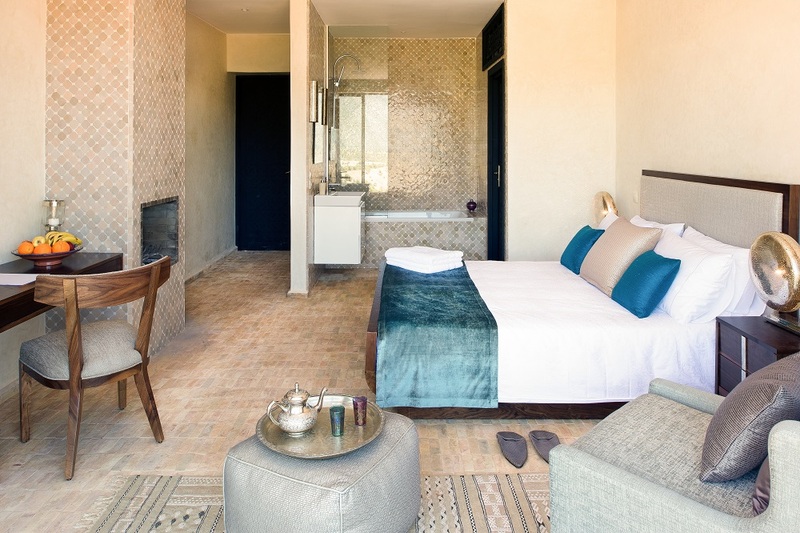 This review of L’Amandier, Marrakech, Morrocco originally appeared on 1 August 2016 in http://hoteldesigns.net/latest-hotel-review/miniview-lamandier-marrakech/ written by Amelia Walker. 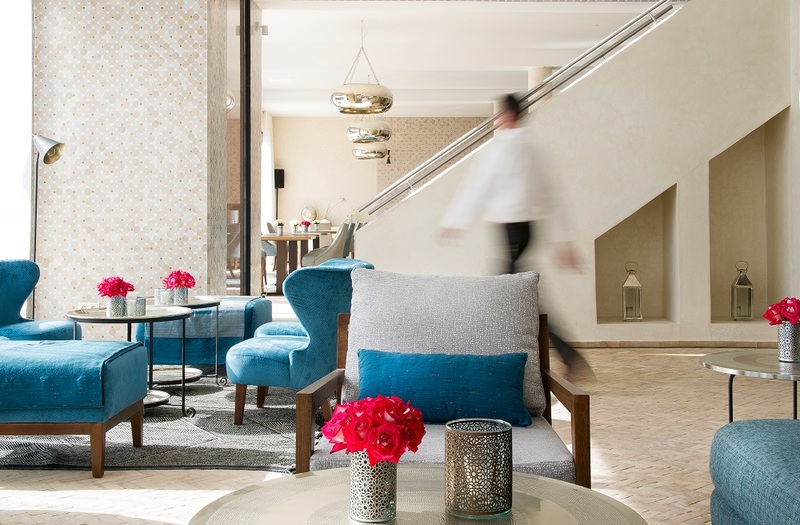 The long-awaited launch of the five-star L’Amandier hotel has finally been unveiled. It is nestled in the Ouirgane Valley and only an hour from the city. “My brother and I discovered this place some years ago when it was a scrub of land, with a few dying almond trees and nothing else. This was the start of a colourful journey of new friendships, discovering water, running water, sowing seeds, laying brick on top of brick, bring in power…and now we are here,” says Founder, Anwar Harland-Khan. Well, for those of you in need of inspiration for an international destination, be it for incentive travel, a private party, a conference, a holiday, team builder or celebratory venue, this gem-like haven is a beguiling place. “L’Amandier has been quite a journey,” says Anwar. We are sitting on one of the villa’s expansive sun-warmed terraces, within 12 acres of citrus groves and almond trees, surrounded by a patchwork of valleys and mountain peaks. The panoramic views over the surrounding Toubkal National Park that we’re looking out on are spectacular. Aside from the gentle hum of the call to prayer that I can hear in the distance, it is peaceful, quiet and wonderfully still. I can’t remember the last time that I’ve felt this relaxed. ‘Landscape therapy’ here is instant and you immediately give in to the pace of life. Calm trickles down from the top after all – and Anwar is warmth and charm itself. I am one of the lucky media guests invited to the hotel’s soft launch (before it officially opens its doors in Autumn 2016), to join his friends and family to celebrate this 12-year project coming full circle. 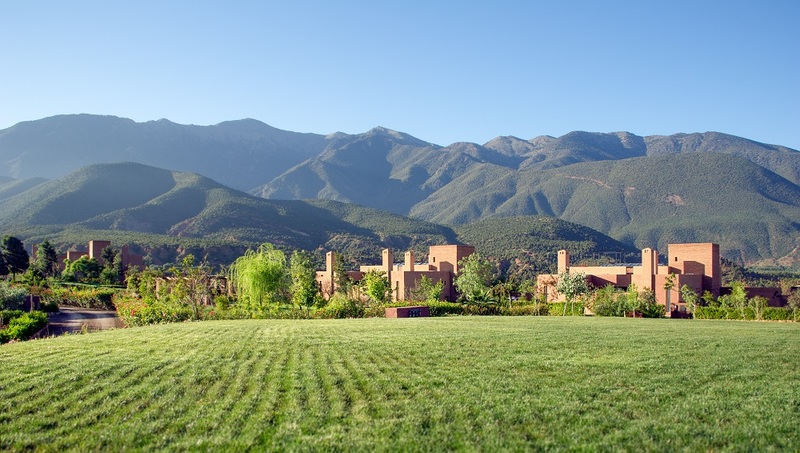 L’Amandier is an environmentally sensitive venture that has remained sympathetic to its surrounding environs. The property has been designed by London-based architect, Nick Gowing, who has juxtaposed the contours of the surrounding landscape with the buildings geometric lines. His aim? To ensure that the beauty of the vista was incorporated into the living and communal areas where possible, through floor-to-ceiling windows (light and space are recurrent motifs throughout), and buildings rendered in the same colour as the rich, red earth of the L’Amandier Plateau, merging it as part of the landscape, in form and function. 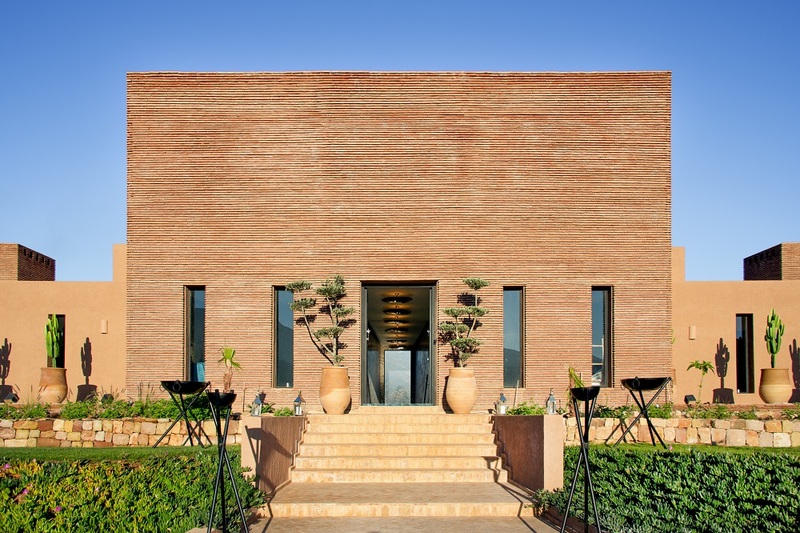 The premises accommodates up to 46 guests in the six suite boutique hotel and the 13 estate villas. All villas have been sold to private investors but are available to rent (each owner has full use of the hotel’s facilities and access to In-house Catering with Private Chef). Each boasts a vast roof terrace with frame pergola style seating area, swapped with deep cushions and white cotton drapes, and showstopping vistas – the perfect backdrop for sundowners. The architecture is cubist in form yet embraces the characteristics of a Moroccan riad – whereby the rooms are built around a central courtyard. 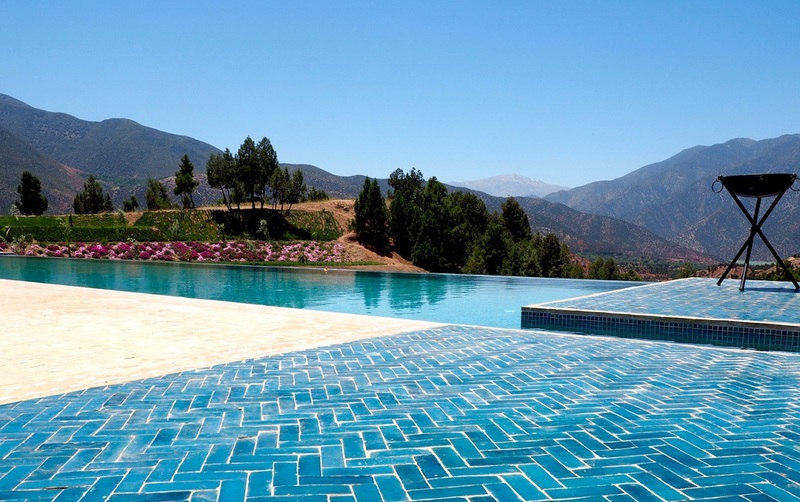 Each villa accentuates L’Amandier’s philosophy of uniting a contemporary European design aesthetic with traditional Moroccan artistry and sustainable materials, think tadelakt walls, bejmat tiles and local walnut wood for the furniture. Elsewhere there’s a 50-cover restaurant, a blinding 25m-infinity pool, tennis court and a vast 40m2 terrace perfect for alfresco soirées. I felt a shift at L’Amandier. At one point I did nothing but stare at the view for 40 minutes – no need for emails, or phone. It is a heady mix, this seamless blend of indoor-outdoor living and the combination of culture, creativity, spirit and vision.